This slow cooker apple cider is like comfort in a cup. The caramel apple cider is packed with so much flavor, making it the perfect fall or winter drink. The silky caramel is like a taste of heaven. The best part? The slow cooker does almost all of the work for you! 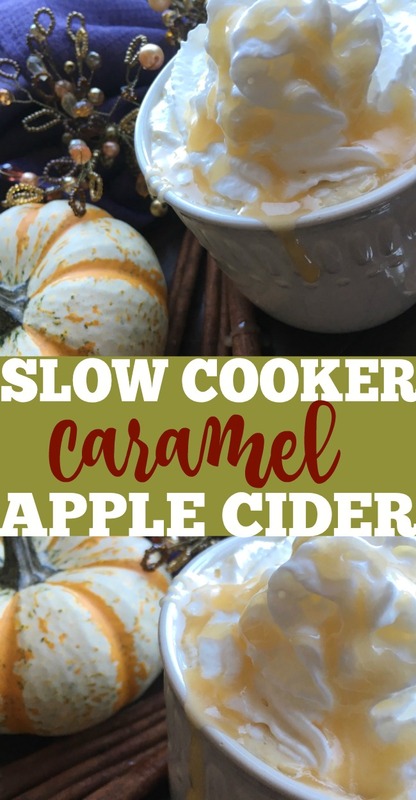 Oh, and did I mention that this slow cooker apple cider will have your house smelling amazing! Note: you can simplify this recipe quite a bit with the use of pre-made caramel sauce and whipped cream. However, for a truly decadent experience without all the artificial ingredients, give the homemade versions a try at least once. If you don’t have pumpkin pie spice, you can make your own by combining 3 T. cinnamon, 1 T. ground ginger, 1 T. ground nutmeg, 2 t. ground allspice, and 2 t. ground cloves. Store in an airtight container. Pre-heat oven to lowest setting. Warm the heavy cream in a small saucepan over low heat. (You’ll want to slightly warm the cream to prevent curdling when it is added to the hot liquid). Add the sugar and water to a heavy-bottomed oven-safe saucepan and stir to combine. Set spoon aside and do not stir the sugar mixture again. Bring mixture to a boil over medium-high heat. If sugar crystals remain on the sides of the pan, gently brush them back down with a moistened silicon baking brush. Continue boiling until the mixture turns a nice amber color. Do not overcook. If mixture gets too dark at this stage, you will need to start over. If a dark spot forms on one side due to uneven heating, lift the pan and gently swirl until the color is even again. Return pan to the burner and reduce heat when the desired color is achieved. Slowly whisk in the warmed cream until thoroughly incorporated. Be very careful while doing so because the sugar mixture will be extremely hot and will bubble up when the cooler cream is added. Remove from heat and add butter. Stir with a clean spoon until butter is totally incorporated into the mixture. Cool and store in airtight containers in the refrigerator for up to 5 days. In a large glass bowl, blend 1 pint of heavy whipping cream with a hand or immersion blender until it doubles in size and changes the texture. Then, drizzle maple syrup into the bowl and continue blending until the mixture is light and fluffy. Add the apple cider, brown sugar, pumpkin pie spice, vanilla, and cinnamon sticks to your slow cooker. Cover and cook on low for 3 hours. After 2.5 hours, stir in ½ cup caramel sauce. Cover and allow the flavors to mingle for remaining 30 minutes. Remove and discard cinnamon sticks. 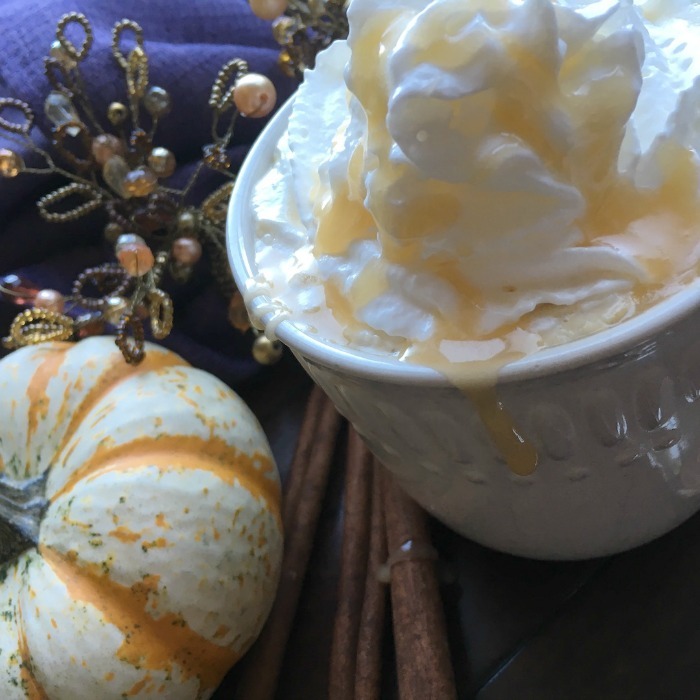 To serve, ladle the hot cider into mugs and top with maple whipped cream and drizzle with additional caramel sauce.